From her perch at the front desk of the Brookline Senior Center, Kathryn Kilpatrick overhears all the talk. The patrons gossip about which teachers they like best, what's for lunch, and, of course, blood pressure. Another popular topic: the competition many of them feel as they vie for the love and attention of their grandchildren. So, who are they competing with? The other set of grandparents, naturally. Oh, Grandma of yore, you sweet little old lady, where have you gone? To the mall, it seems, to score just the right toy to outshine the other grandmother. Or online, to book an untoppable grandparent-grandchild trip to Disney. Blame the increased competition on the baby boomers, who are eager to be "the best grandparents ever," says DJ McQuade-Lancaster, coordinator of the nonprofit National Grandparents Day Council. Or maybe on Marian Robinson, Michelle Obama's mother, who's upped the grandma bar by moving into the White House. Or perhaps demographic forces are at work. The ranks of grandparents are increasing at more than double the rate of the overall population, according to a new study commissioned by Grandparents.com. There are now some 70 million grandparents in the United States. And my, what a big spender you are, Grandma: 42 percent of all consumer spending on gifts is by grandparents, according to the survey. But we're not just talking about Xboxes and DVDs here. The survey indicates that grandparents will spend $17 billion on education for their grandchildren this year, and more than $10 billion on clothing. Such expenditures have been rising for several years. 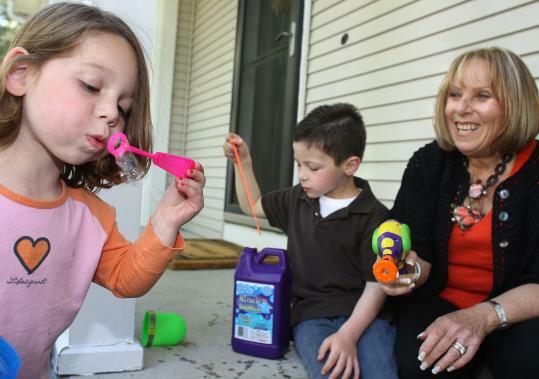 Spending by grandparents on their grandchildren is up an average of 7.6 percent per year since 2000, the survey says. Most grandparents aren't engaged in a duel with their co-grandparents, but the desire to be the most beloved, most generous grandparent often simmers beneath the surface. "There's always competition," said Tony Fava, a semi-retired owner of a construction business, who was in town recently visiting his grandson and daughter in Brookline. "You always want to outdo." At 64, the fit, silver-haired Fava is older than his son-in-law's parents, a perceived disadvantage he's determined to overcome. "It makes you want to be more competitive." He dresses in a youthful way, he said, and plays sports with the grandkids. "There is so much love involved that everyone is trying to pull their way." It's been called the "Grandparent Olympics." One cutthroat grandfather who asked that his name not be used calls it the "grandparent wars - it's a game you play for keeps." No one keeps statistics on grandparents gone wild. But Susan Stiffelman, a licensed marriage, child and family therapist, says she regularly sees a "low-key desperation to be the most popular grandparent." The competition takes many forms - it can be over gifts, vacations, sleepovers - and it can start before the first grandchild is born, with expectant grandparents contending for the right to see the baby first, or snag a desired name. Jayne Beker, a psychologist, was in town recently for Grandparents' Day at her granddaughter's school, an event at which the first-grader would be shadowed by all four grandparents. Everybody gets along wonderfully, Beker said, but even so, the competition is always there. "It's an underlying thing," she said. Amy Goyer, family expert for the American Association of Retired Persons, often hears from grandparents eager to learn how to "keep up" with the other side. "It escalates and kind of can get out of control," Goyer said. Occasionally she recommends mediation. "It can get to the point where they can't speak to the co-grandparents, or the parents can't have events where they're both there," she said. The crucial thing to remember, she added, is: "Who's the adult in this situation?" That can be hard to tell. Consider the discussion that erupted on the Grandparents.com site when "grandmajones" admitted the following: "I know this sounds terrible and extremely petty but I have found myself in a somewhat competition with my son-in-law's mother over the oldest grandchild who just turned 5. . . . My grandson tells me that I am his favorite . . . now I know that he also tells this to his other grandma. He's just a little boy that tells a lot of people that he loves them. But it's like his other grandma thinks he says it solely to her and that she is the 'real' grandma deserving of the name and I am just the other grandma." "Coloradonana" was right there with her. "I thought I was the only one that felt the way you do so I've pretty much kept it to myself," she wrote. "Sometimes it does bother me to see my grandchildren with the other grandparents." Stephanie Coontz, director of research for the Council on Contemporary Families, sees such excessive behavior as the downside of a positive change: a new intergenerational closeness. "There's an increase in desire for these relationships, and the understanding that these relationships are more central to people's happiness," she said. "In the early 20th century, people rejected the authority of the older generation and emphasized the self-sufficient nuclear-family. Today, we are more aware that you can't put all your emotional eggs in that one basket." That increased closeness may also be due in part to the rocky economy. With many parents financially strapped, some grandparents are pitching in to help. "At least one-third of older Americans say they give significant financial gifts to the grandchildren," Coontz said. Many grandparents happily coexist with their co-grandparents. But for others, the relationship is a relentless game of one-upmanship in which two adults, or more, vie for the affection of children, some of whom are too young to speak to or even recognize the competitors. Consider the case of "Nana," a local grandmother engaged in a rivalry so intense that she asked that her name not be used. No sooner had Nana sent her granddaughter a cute pillow with a pouch to hold a lost tooth than the girl's other grandmother mailed her one. Nana bought tickets for a Broadway show. She bought tickets for a Broadway show. Nana gave the girl a charm bracelet. She gave the girl a charm bracelet with more charms. "All this sounds funny," she said, "but in truth it has created a very difficult scenario. This is not anyplace I would have wanted to end up. I'm not even a competitive person." Talk to enough grandparents and one thing becomes clear: Because she's closer to the mother of the children, the maternal grandmother generally has a slight advantage. Or, as Audrey Berson, of Marblehead, put it: "She's my daughter, so I have the edge." Even so, Berson's co-grandmother works in the same town as the grandkids, and she sometimes meets the bus after school. "It bothers me," Berson said. "I wish it were me." Stiffelman, the therapist, sees grandparents trying to undo old wrongs. "To some degree grandparents are rewriting the story of raising their own kids," she said. "There's this second chance - now I can really raise a kid who will love me. They are saying, 'You can heal me from the painful relationship I had with your parents.' "
"I also think there's a loneliness when you are a grandparent," she said. "So you're projecting on this kid a lot of hope to define your life as meaningful. Now you've got this kid whose job it is to make you feel important and loved, which is not a healthy thing to do." But, she added, most kids aren't going to put a stop to it. "You've got kids saying, 'Sign me up - more candy, a new doll!' "
And many grandparents are willing to do whatever it takes to "win," noted McQuade-Lancaster, of the National Grandparents Day Council. "The baby boomers were hippies. I know that's a bad word, but the hippies took life by the horns. That's the way this generation of grandparents operates."